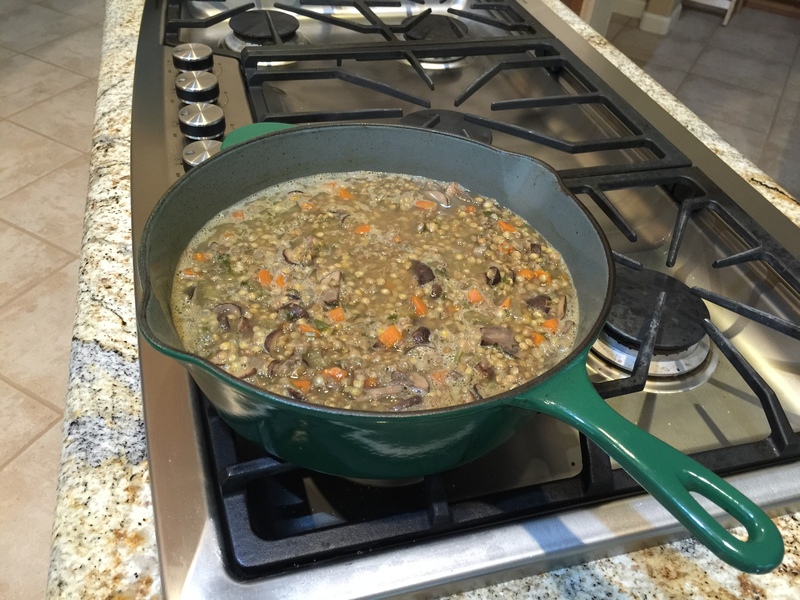 What could be more comforting than a big pot of lentil stew! I debated whether I should call this soup or stew but decided it was thick enough for stew. I actually made this the day before because I wanted to use some of the lentils with my leftover farro yesterday. First I made a mirepoix of celery, onions, and carrots cut up quite small. I sautéed them along with the mushrooms. Then added water, or vegetable stock, or chicken stock depending on your nutritional lifestyle. When the lentils were cooked through I added a large chop of carrots and celery and cooked them briefly. You want them with a little crunch. Topped the stew with chopped parsley, green onions, and a drizzle of olive oil. Note: Non-vegans/vegetarians might enjoy some sort of firm, cooked sausage in this. This entry was posted in Vegan, Vegetables, Vegetarian and tagged carrots, Celery, lentils, mushrooms, Onions, Vegan, vegetarian. Bookmark the permalink.